These leather briefs from the 300 movie feature adjustable rear snaps for better fit. Available in S/M or L/XL. 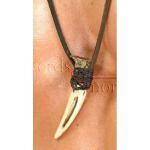 This giant wolf´s tooth necklace from the 300 movie is made of resin and comes with a leather thong. These sandals from the 300 movie are made of brown leather and feature rubber soles. The three ankle straps are adjustable. Available in men´s whole sizes 7-13. This Spartan Cape is officially licensed product from Frank Miller's 300, the graphic novel. Made from authentic materials, and fully wearable/functional and durable. Includes custom labeling. 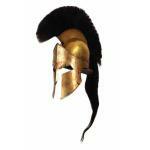 Don´t miss out on this cape, the mark of a true Spartan warrior. This stunning set of greaves, or leg guards, is necessary for the full Spartan outfit. The greaves are plated in antiqued brass. The strapping allows a perfect fit. Máte doma vystavenu nějakou repliku podobnou těm v naší nabídce ? © All rights reserved, RYJO Trade s.r.o.